Magogo (L) and Kasule shake hands after picking nomination forms yesterday. 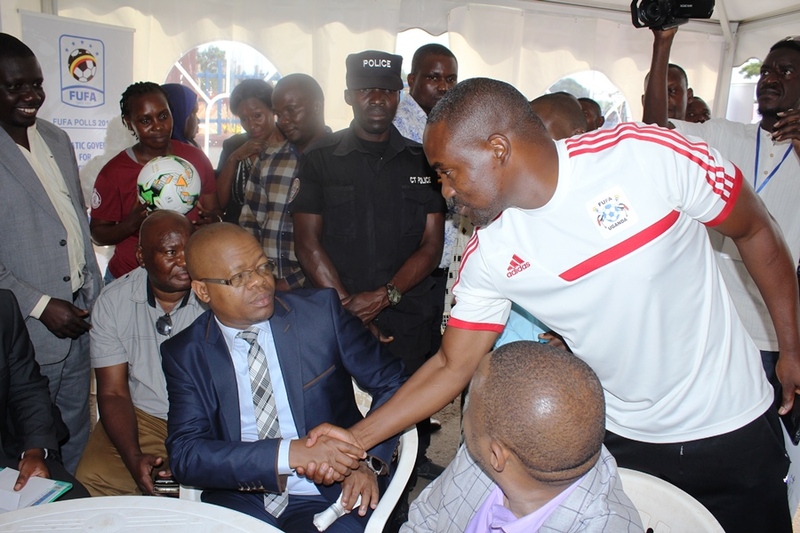 After all the threats and talk in corridors about who will challenge Moses Magogo as head of local football governing body Fufa over the next four years came down to one challenger. By close of registration on Tuesday only Proline director/coach Mujib Kasule had picked nomination forms after returning the Shs3 million paid bank slips to the office of the Electoral Commission headed by Sam Bakiika. “Personally, and many Ugandans, we are not happy with the way the game is being run,” stated Kasule who worked as Vice President under Magogo in 2013 before resigning a year later. “My strength is my known passion for football and my passion for doing the right thing,” added the former KCCA captain and Ugandan international. The would-be third candidate and Villa president Ben Misagga did not return the bank slips and will not be part of the nomination process that ends on Friday when the forms are returned. Honorary Fufa president Lawrence Mulindwa, who was thought to habour ambitions of returning to the top seat, did not get involved in the exercise. He raised speculation earlier this year after threatening “to pick his gun from the subcounty” after what he called federation’s failure to curb abuse directed at him by members of the current administration.